1.) An Early Blast of Winter? Ready or not, here it comes! Our first widespread, potentially-accumulating snow (and ice) of the 2018-19 season. Winter storms are complicated beasts. Especially in the early and late parts of the season, when the sun angle is still relatively high, the ground still relatively warm, and storms can be particularly virulent. The main reason why winter weather forecasting is so difficult and such an inexact science? Temperature. We can see a completely different array of weather if the temperature is 33 degrees or 32 degrees or 31 degrees. (And that's not just at the surface, that goes for the entire bottom half of the atmosphere.) As you'll see all winter, that is why I have to talk in generalities and possibilities, putting ranges and measures of confidence on every forecast I issue. That is especially true with the sloppy, slippery setup taking shape for Thursday. Wednesday will remain quiet, although cold — probably our coldest day since March. High temperatures will be limited to the lower 40s, with some peaks of filtered sunshine throughout the day. Wednesday night looks very cold, as most low temperatures dip into the 20s. Clouds will be on the increase too. Our coastal storm (nor'easter) will push into southern New Jersey sometime Thursday morning. Initial precipitation will be wintry mix inland and all rain along the coast. The worst part of the storm, with the heaviest precipitation, will kick in Thursday midday. Slowly but steadily, as temperatures rise above freezing, snow/sleet will transition to freezing rain and then all rain. I am particularly concerned about messy travel conditions for the Thursday evening commute home. The storm will calm down by Thursday late evening. One more round of generally-light, almost-exclusively-rain will pass through New Jersey Friday morning. Skies will start to clear (with a continuing brisk wind) Friday afternoon. As temperatures rise slightly Thursday evening, a period of freezing rain is possible. That could lead to a layer of ice on top of the freshly fallen snow and/or any other cold surfaces. 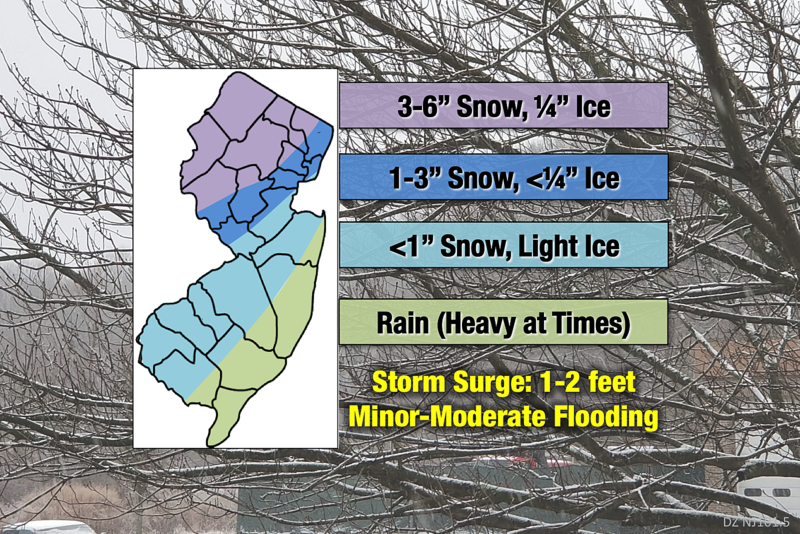 Up to a quarter-inch of ice accretion could also lead to downed trees and branches and power problems — ice is clearly our worst-case scenario. Temperatures close to the coast (especially for Ocean, Atlantic, and Cape May counties) will stay above-freezing throughout the storm. That will be assisted by the strong northeasterly winds carrying warmer marine air over land. (Ocean water temperatures are still mostly in the 50s.) So we're generally talking about just rain at the Shore. Sure, there could be a few snowflakes mixed in. But accumulation and travel issues due to winter weather are unlikely. Having said that, the rain could be heavy at times. Forecast rainfall totals are mostly in the 1.5 to 2 inch range. If heavy downpours develop, localized flash flooding could become an issue. Typical of coastal storms, the strong northeast winds will drive ocean water toward the Jersey Shore. Latest tidal guidance shows about 2 feet of extra water flowing toward the southern coast (Atlantic City and Cape May), with 1 to 2 feet of surge forecast around Sandy Hook. We're luckily at a low astronomical tide cycle right now, which will help to mitigate the potential for saltwater inundation. However, minor to moderate flooding of tidal waterways will be possible at the times of high tide. It looks like there will be three higher-than-usual high tide cycles: Thursday early afternoon (1 p.m.), Friday early morning (the peak, around 1 a.m.), and Saturday midday (Noon). As of Wednesday morning, no warnings, watches, or advisories have been issued for this storm by the National Weather Service. I suspect at least an advisory (possibly a watch/warning) will come out by mid-afternoon. We'll keep you posted. Although snow won't be the only precipitation type, parts of the state (especially north and west) may ultimately have to shovel out and plow out. Keep in mind the snow will be incredibly heavy — practically slush — and so it will be heavy and difficult to clear. In addition to the concern I mentioned before about the evening rush hour being particularly sloppy, let's keep in mind that roads have not been salted yet this year! Usually, by March, our highways are bright white from non-stop chemical treatments throughout the winter, providing a sort of "natural immunity" to snow and ice. Not the case here — hopefully the DOT and county road crews can get ahead of this storm, out of an abundance of caution. I've been saying it on the radio all morning, and I'll say it again here. This isn't a major winter storm. It's not a blizzard. It's not going to shut down the state or close schools for days and days. It's just going to get sloppy and slippery. Be smart, stay safe. It's that simple. I will put out a (brief) weather blog update sometime Wednesday afternoon or early evening. We'll send out an alert via our mobile app as soon as it's ready.